I am writing this to you after five long days of Hurricane Sandy, which touched down last Monday evening and did not let the sun come out until the end of the week. I consider myself one of the lucky ones because we were only without power for 48 hours, and save for a single sponge bath that took me back to the days of Lincoln, and momentary panic that I was literally cut off from the world for that time, I came out of the whole ordeal relatively unscathed. Others that I am close to have not been so lucky, and they, along with so many others in the greater New Jersey/New York area are still in pain. It's scary to think that something of this magnitude can happen in a matter of minutes. It's even more frightening to realize how little control we have in this kind of situation, and how salvation can only be given in the face of mercy. With this new week beginning, we are all looking for a fresh start and a chance to put the horror of last week behind us. But even if we ourselves are ready, there are still many forces at work that we need to wait for. That's the hard part about it - the waiting. With rarely any boundaries put into place, we feel restless and anxious, eagerly yearning for any new tidbit of information that will allow us to move forward finally. How do others find the strength to push past and create their own path? 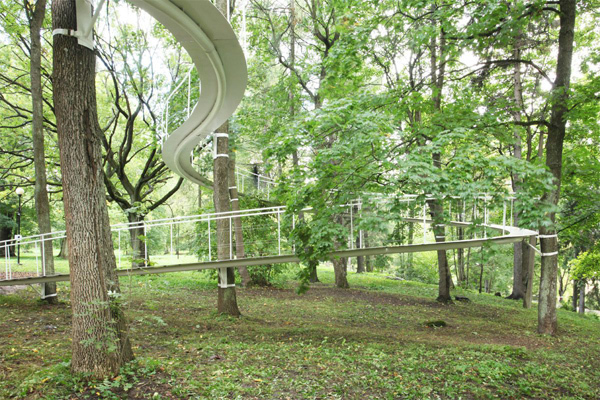 I took inspiration today from an installation built in the woods of Tallinn, Estonia by Japanese architect Tetsuo Kondo. 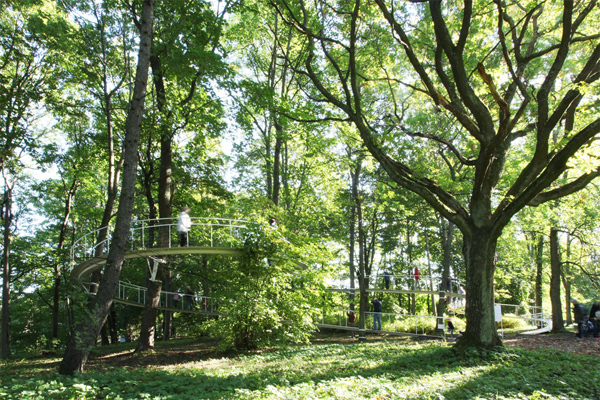 In 2011, he changed the way people walked through Kadriorg Park by creating a winding path amongst the trees themselves, which in effect put the wanderers on par with the lush scenary that this area was made of. Tetsuo did not negatively affect the environment in any way; rather, it was almost as if the structure and the park coexisted peacefully in order to provide something more to passerbys. By working together, a far greater and more enhanced experience was made - one that was bigger and better than what was already being offered. The level of aid and empathy shown to the east coast recently has astounded and humbled me. I have blogged before about the stoicism and cynicism that permeates New York City, and how I both fear and accept that it is just the nature of things. But through this, I see that we hold no higher commitment than to our fellow man. I desperately want to believe that we are fundamentally good, and that from the darkness, a light is always shown. That cooperation will always be more beneficial than standing alone. That is what will take us to tomorrow. These Mizukagami water mirrors, designed and created by Rikako Nagashima and Hideto Hyoudou in a collaboration featured at Japanese art gallery ROCKET, are certainly attention-grabbing, but also have the distinct feeling of almost being a mistake. 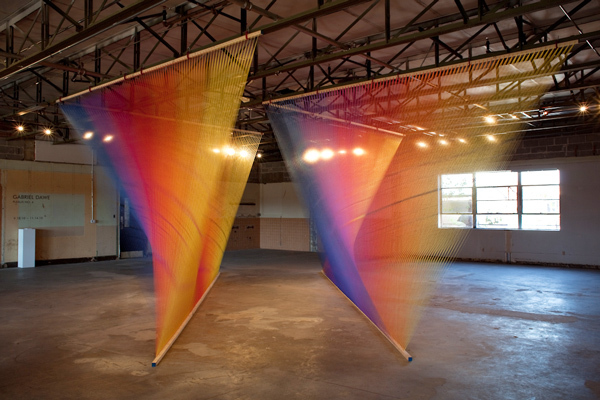 Instead of each piece being a complete and seamless object, the artists have given it tendrils that drip to the ground. One in particular even has a crack in the middle which indicates the natural ripples seen when you disturb the surface of water with a rock, but can appear to be broken and disconcerting to viewers. All in all, this is one spill that I wouldn't have to clean up. This series reminded me of Salvador Dali's painting The Disintegration of the Persistence of Memory as I made the visual link between the dripping mirrors and Dali's melting watches. Dali's work focused on the fragmentation of man's world notwithstanding universal balance, which meant that in spite of all attempts to reach utopia, it is that directive that could bring about man's demise. Is this a growing trend in our industry lately? Is this deliberate imperfection a response to the pursuit of perfection that the creative world holds as its ultimate goal? Is the latter preferred achievement that has guided many freshly graduated students finally growing old? I see designers struggle to make their work "perfect" and display it as such so that the world can know exactly what they stand for. But to what end? How much longer can we let this unsaid requirement lead us? The Mizukagami mirrors cannot be seen as something stereotypically whole and functional, but beauty has always been seen in the eye of the beholder. As long as we stand tall with conviction and belief in ourselves, everything we produce will always matter in some way to someone. Don't try to be like everyone else. Stand out and be proud to be different. 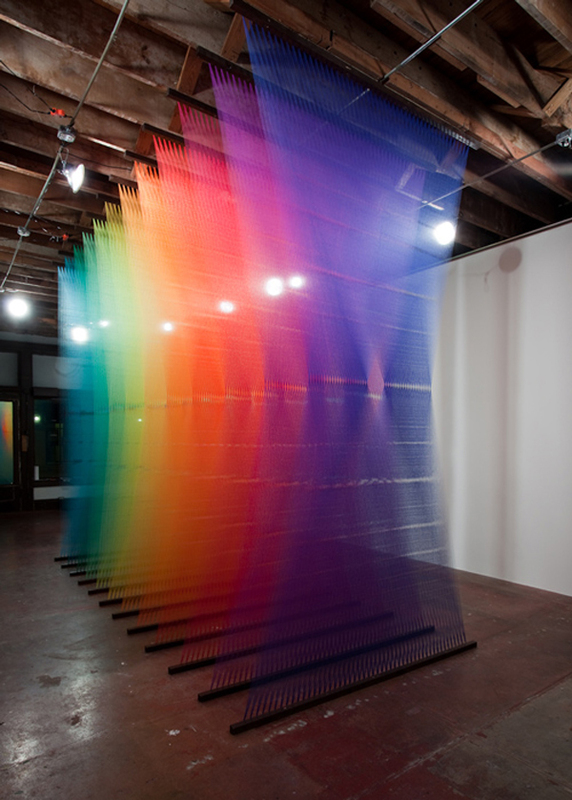 Seeing these thread installations by Gabriel Dawe makes me think of a water mirage that desert dwellers sometimes imagine after a long, hot day - you're not quite sure if it is real or just a fantasy. 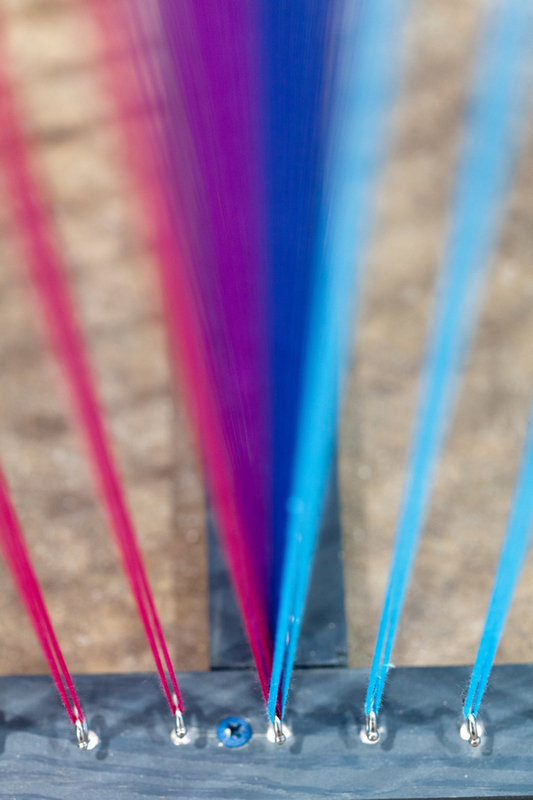 Its solidity appears impossible, your body wants to move through it like a rainbow, and it is only when you get up close that you find the true implications of the sculpture. 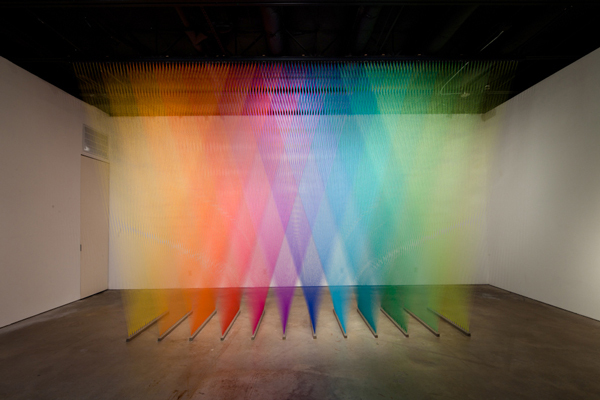 I can sit back and look at Gabriel's work all day, because each angle brings about a different interpretation of the piece due to the way it reflects the light and creates an optical illusion with a dizzying effect. One can't dream of the time and effort it must take to put this together. Nor the focus. With work as physically and emotionally daunting as this, it is so easy to call it quits in the middle. But that dedication to their craft is what sets artists apart. The intense concentration that gets someone going until they reach the end. The inspiration that gives them a reason to get up in the morning in the first place. How many of us can say that we know what that feels like? Bringing the phrase, "Reuse, reduce, recycle" to a whole new level, industrial designer Garth Britzman uses over 1,500 plastic bottles to create a car park canopy and enrich our knowledge about what amazing things can be built from ordinary household items. 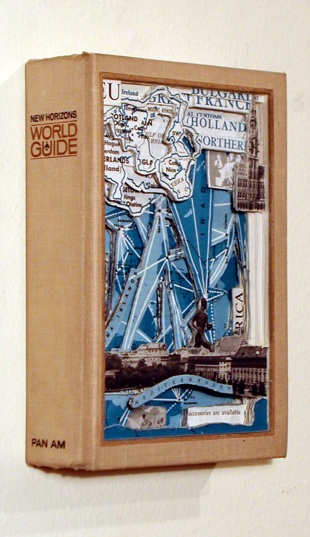 When I saw this project, titled (POP)culture, my curiosity was piqued as to what those "stars" were made of. It is only when you're up close that you can tell each bottle has been painstakingly filled with the same amount of colored liquid, and the overall effect is reminiscent of what you probably see when you are underwater looking up towards the surface. What's great about this setup is that sunlight and other natural elements will change the chroma of each bottle over time, ensuring that each person who sees this will see it differently. It must be incredibly freeing to sit in your car and look up into this beautiful view, a lovely testament to the green movement that we are constantly striving to improve. 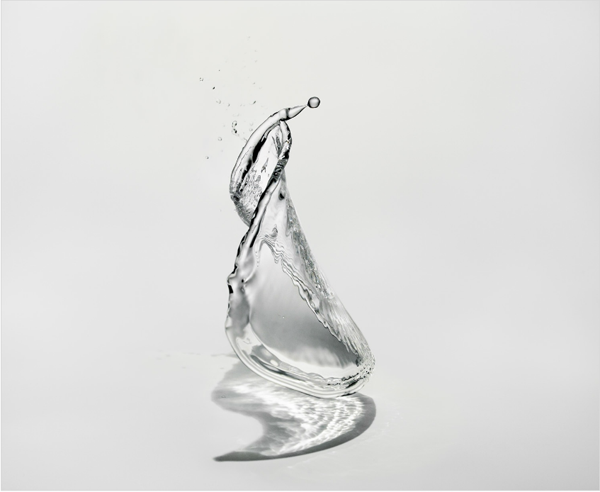 When you are feeling the weight of the world on your shoulders, as I suspect many of you felt this past week with the rain, take one look at these water sculptures by Japanese artist Shinichi Maruyama in order to feel some semblance of hope. Shinichi's usage of liquid, a Phase One P45 camera, and a Broncolor Strobe brings us a moment in time that is unable to be recreated ever again. 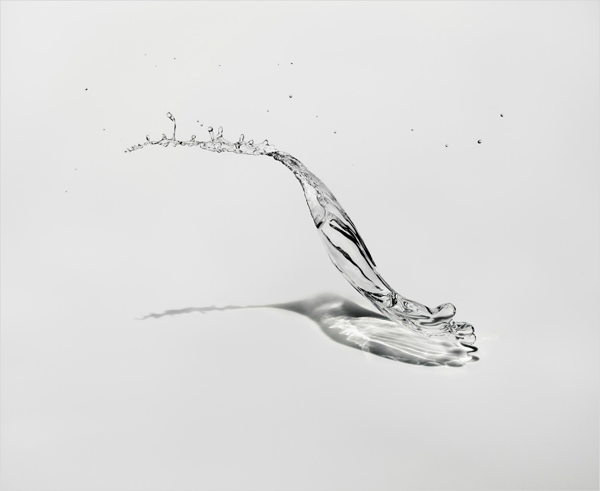 However, it is the manipulation of this substance, which sees it being gathered in a pool, thrown into the air, and splashed onto a surface, that tells a story about the unexpected and how things sometimes need to break down in order to come back together. There are so many what ifs in our lives, especially during periods of transition, and we often wonder whether or not we are making the right decisions. But I think Shinichi's work can teach us how to take things in stride because by watching his process video above, it is clear that despite the shifting of space in that split second that the sculpture exists, in the end it is all but the same element that it started with. Thus, change isn't the evil that we can perceive it to be, and maybe this different view is what we need to move forward and find something else. With Spring fastly approaching, I wanted to give us all a chance to relive this fleeting winter wonderland one last time in the form of these incredible snow crop circles created by Sonja Hinrichsen. This installation was done in Rabbit Ears Pass, Colorado with the help of 5 volunteers who trekked through the vast expanse of the Rocky Mountains to bring us a visual delight from up above. What looks like simple footsteps from the ground becomes a different view entirely once you see the bigger picture. As an artist and environmentalist, Sonja's top priority is to maintain the vitality of nature by composing her works in a way that is impermanent, and easily disintegrated organically. In purposefully building something whose mark cannot be felt forever, she brings our attention to society's tendency to overproduce, oversell, and overprioritize materialism, and the notion of quantity over quality. When something beautiful is this fleeting, Sonja's hope is that we appreciate our moment with it just a bit more than we normally would. One theme that I regularly discuss on Sketch is the theory of transformation and our society's journey to conciliate the past with the present. I am right there with you when I say that I, too, participate in the almost ritualistic practice of trying to stay ahead of the game by exhausting my senses with novel concepts. Fads that were popular once upon a time are thoughtlessly discarded in a heap along this highway of ideas. Keep in mind that it's not just the intangible that undergo this trauma but also the corporeal, and this is where my post today begins. What happens to those items that are left behind, and are they abandoned because they no longer hold any value? 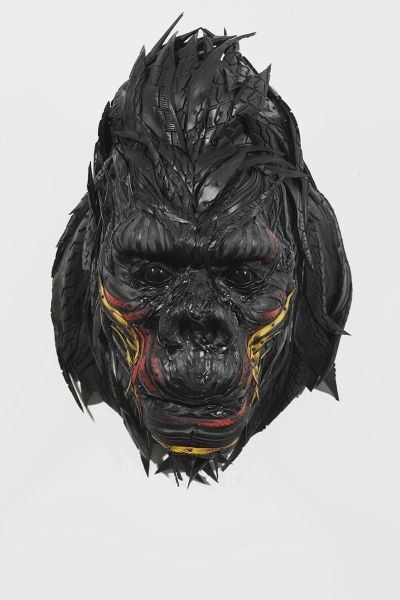 Korean artist Yong Ho Ji thinks differently, and his pursuit is to give them new life by way of creating labyrinthine beings out of old, salvaged tires. Because each sculpture's power resides in the interlacing components of its flesh, it is crucial that Yong Ho holds a solid anatomical awareness to ensure that it looks as convincing and natural as possible. To make this happen using a tire of all things is, suffice to say, quite the ambitious task. Many different types of tires go into every one, such as the thinner, more pliable bicycle tire for the delicate muscles in the face, and a thicker, more callous tractor tire for the body. Every piece is painstakingly built so that the end result resembles a primodial creature whose shape is as macabre as it is captivating, and I sense that they are designed to represent each animal's true self in nature. After viewing these, can you honestly say that there is no reason why we shouldn't reuse, reduce, and recycle? 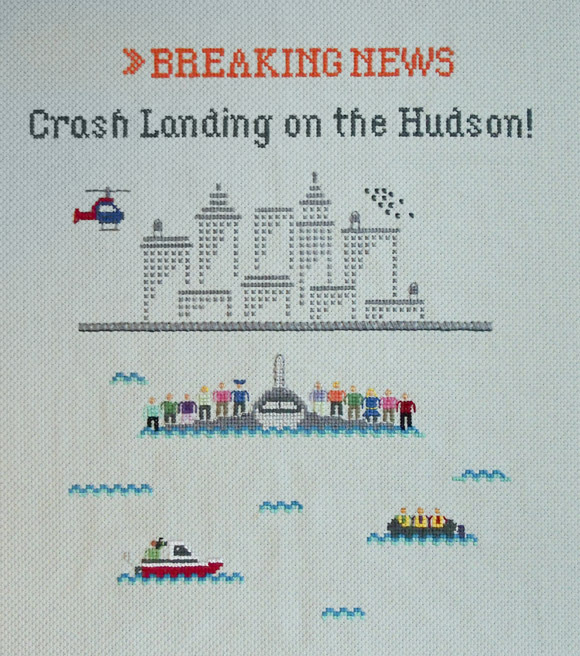 Graphic designer Emily Roose has discovered a way to combine art, news, and old-fashioned charm into one complete package via her series, Slow Breaking News. Dedicating her time and effort (each sample takes about 25 hours to sew) to memorializing major current events that, at the time seem unforgettable, Emily makes a decision as to the holding value that each story has and perceives whether or not it will still be newsworthy with the passing of time once she has wrapped up its accompanying cross-stitch. Because the reality is that we absorb information at such an expedited rate that this week's shocker is next week's archive, the irony behind how long she spends to finish each piece is a large component that is meant to be exposed and explored. I think about how much has happened in the world since we were born, since last week, since we woke up this morning. It is true that while these events had us in their grips during their occurrances, the fact is that we tend to have a "been there, done that" attitude due to the sheer abundance of knowledge we drink in at every possible moment. And it's not our fault - this is simply what we must do in order to stay relevant. But having someone like Emily give kudos to the past in her own beautiful way is one method of remembrance, because without yesterday, we would have not reached today to look forward to tomorrow. It's finally that time of year again when the wind gets chilly, the early morning wakeups are still swathed in the black night, and the leaves start to change color. 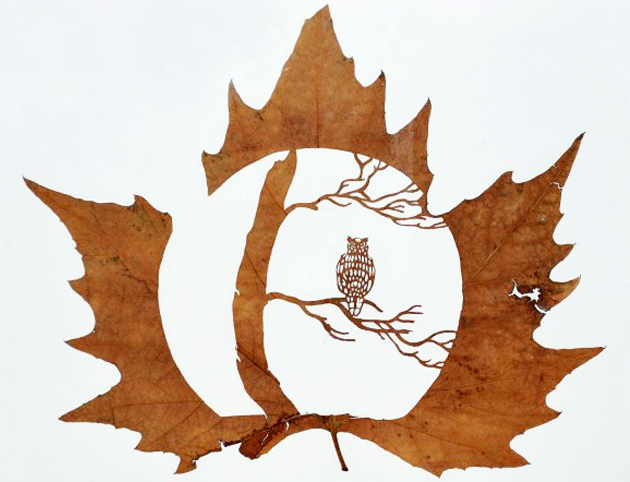 I thought I'd hail the start of Fall with some extraordinary plant cut-outs by Lorenzo Duran, an artist whose sole existence is dedicated to celebrating nature. Drawing faith in the fact that the environment is home to a whole bevy of creative matter, Lorenzo picks, washes, dries, presses, and then cuts the leaves in a fragile process that is fraught with the threat of these delicate sleeves ripping to pieces. He has continuously worked on his craft so that for every hundred that are destroyed, one leaf may live for us to appreciate its beauty. I went to college in New Hampshire and right now is about the time where the foliage starts to happen. We had a entire field in the middle of campus dedicated to these beautiful trees. If I miss anything about my years there, it is this. Space has always been known to us as a vast, limitless frontier that we could scarcely hope to explore in its entirety in any lifetime. It may be centuries before a human being is able to step onto the surface of Jupiter, but on August 5, 2011, three important members of history hitched a ride on the spacecraft Atlas V and journeyed to the 5th planet in our solar system. 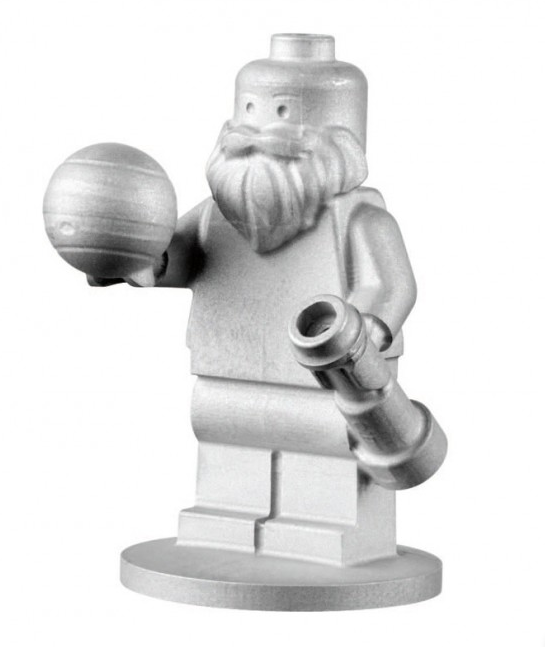 Due to the unique partnership between NASA and Lego, the passengers in question were indeed the beloved construction toys of many a childhood. These miniature replicas of Jupiter, the Roman god of sky and thunder, Juno, queen of the gods, and Galileo, Italian astonomer and philosophor, were built with special and specific blueprints to ensure that they would not interfere with the spaceship's ability to collect data in any way. Forged from aluminum and engineered using the exact same dimensions as the Legos we grew up with, these figurines were befitted with accessories that represented their talents and skills for this trip. Jupiter, with his lightening bolt, Juno, with her magnifying glass in her quest for verity, and Galileo, with a telescope and model of the destination planet, are all acting as brokers in the name of scientific exploration. While it has been over a decade since I last played with Legos myself, the fun and good times of my childhood that they denote are still a very fond memory for me today. The fact that a giant conglomerate like NASA can also understand the joy that this endeavor will hold for many people pleases me to no end. At the end of the day, Lego or astronaut alike, we are all working together to discover what else is out there. When I was growing up, you couldn't find me without a book in my hand due to my avidness as a reader. From a very young age, I would use these stories as a means to escape the reality I belonged to and travel into the hearts and minds of the characters whose lives became my own. The eagerness that I had to bury my head in a novel is something I think about fondly, especially since my time became increasingly occupied on my laptop surfing the internet as I entered high school and college. Now the books on my shelves are dusty with neglect, and you are scarce to find me without my iPhone. Technology has become my heavily relied upon one-way ticket out. I started talking about the past in my posts this week and how designers are finding inspiration in primordial objects to fuel their modern agendas. Brian Dettmer is one such artist whose mission statement defines the very meaning of this approach. His process is one that revives history, not discards it, by providing a new face to an ancient form that has stood the test of time, but like all pre-mechanical items, is in danger of slowly being on its way towards oblivion. He digs deeper into the material to explore its anatomy so that we may take interest in what lies beneath its current state, and then transforms its interface into a completely new construction to reveal the contents in an exquisite fashion. As we move forward in the digital age and leave behind the physical one, we need people like Brian to remind us that not all that has been viewed is all that can be seen.